The Center for Construction Research and Training (CPWR), the National Institute for Occupational Safety and Health (NIOSH), the Occupational Safety and Health Administration (OHSA), as well as state governments, private companies, labor organizations, and others have partnered on the re-launch of this campaign. Falls are the number one cause of fatalities in the construction industry. More than 200 construction workers die each year in the United States from falls, and more than 10,000 are seriously injured annually. 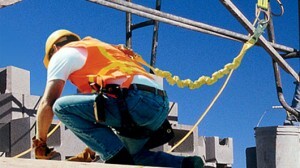 In addition to the resources available on the OSHA website at http://www.osha.gov/stopfalls/index.html and NIOSH’s website at www.cdc.gov/niosh/construction/stopfalls.html, the website hosted by CPWR – http://stopconstructionfalls.com – provides many more resources for training including videos, flyers, a printable information booklets available in English and Spanish, safety checklists, research and statistics, success stories, and news and scheduled events related to the topic. There are links to online resources on Facebook and Twitter as well. A 19-page printable booklet on how to get involved by creating a local “Safety Pays, Falls Cost” campaign is provided on the CPWR website. Extensive information or organizing and funding the campaign, planning local events, and publicizing the campaign is included in the booklet which can be found at http://stopconstructionfalls.com/wp-content/uploads/2013/05/Stop-Construction-Falls-Partner-Manual.pdf. There are also tools for evaluating a local campaign and related events to see how effective they are and where improvements might be needed. Pete Stafford, executive director of CPWR, said, “Too many times we hear the phrase, ‘it was an accident.’ We know these incidents are preventable, which means that hundreds of fall-related deaths and thousands of injuries can be prevented. Our years of data collection consistently show that falls constitute one-third of all construction fatalities, which makes falls the leading killer of construction workers. We’re eager to re-launch the campaign and see fall protection used when workers are at heights.” The campaign’s strategy seeks to raise awareness among both contractors and workers in the construction industry and encourage them to work together to prevent falls and the serious injuries and fatalities that result from them.